Design Burd Inc.The River CafÃ© | Design Burd Inc. Located under the Brooklyn Bridge, The River CafÃ© is one of New York's most unique restaurants. Â With breathtaking views of the New York City skyline and the Statue of Liberty, The River CafÃ© is equipped with the most amazing backdrop for a special night out. Â The River CafÃ© provides a mouthwatering New American menu, with dishes comprised of the freshest ingredients available. TheÂ delicaciesÂ are sure to please the most sophisticatedÂ palettes! 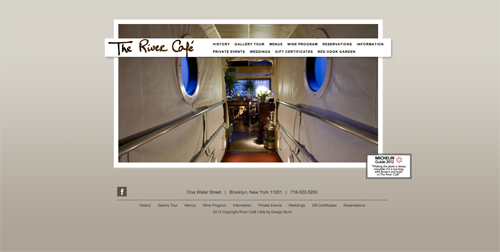 Design Burd proudly hosts and maintains the website for one of New York's greatest restaurants, The River CafÃ©!